Place cookies in a freezer bag. Tightly seal bag and crush cookies with a rolling pin. In a small saucepan, melt butter over medium heat and add brown sugar. Place crumbled cookies into a large bowl and pour melted butter on top. Stir well to combine. Add gelatin sheets to a small bowl with cold water. Leave to soak for approx. 8 – 10 min. Add cookie crumb mixture to a round baking form, press firmly into bottom of baking form, and transfer to fridge to cool for approx. 10 - 15 min. In the meantime, mix yogurt, cream cheese and Baileys in a large bowl. Put the gelatine into a pan, add brown sugar, bring to a boil and fold in the joghurt-mixture. When cookie crumb has chilled, add yogurt and cream cheese mixture into the baking form. Gently tap on counter to release air bubbles. Transfer to fridge and allow to set for approx. 3 - 4 hours. Finely chop chocolate and transfer to a large bowl. In a small saucepan, bring espresso powder, cream, and golden syrup to a simmer over medium heat. Pour over chopped chocolate, let stand for approx. 15 – 30 sec., and then stir well to combine. Carefully run knife around edges of the baking form. Remove cake and transfer to a cake platter. Evenly spread ganache over top of cheesecake. Garnish cake with an outer ring of coffee flavored chocolates. 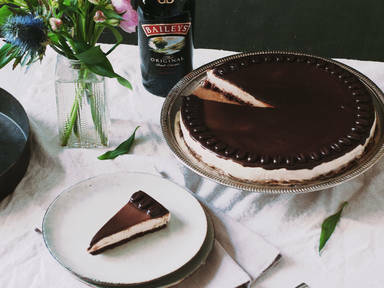 Enjoy with a cold glass of Baileys!